I love that sauce you get at popular high-end chain and Argentinean steak restaurant Gaucho Grill. Nearly as much as I love the overkill of cowhide. The green sauce – hot, lots of parsley and plenty of chillies in it. I slap it liberally all over my rare Ribeye, dunk my bread in it and pour it over my sweet potato fries whenever I dine at Gaucho. I bloody love the stuff. Apparently it’s called chimichurri. The Argentinean equivalent of ketchup. I’ve never really thought about making the stuff myself. Until last weekend. I picked up a couple of Ribeye steaks from my local butcher – the world-famous Weegmanns in Otley, and decided to give the stuff a go. Spice up my steak a little. Not that it needed it. Fast-forward five days and I’ve slapped this delicious green stuff on everything – roast chicken, steamed cod, baked salmon and steak. I’ve dipped carrot sticks into it and poured it over my salad. 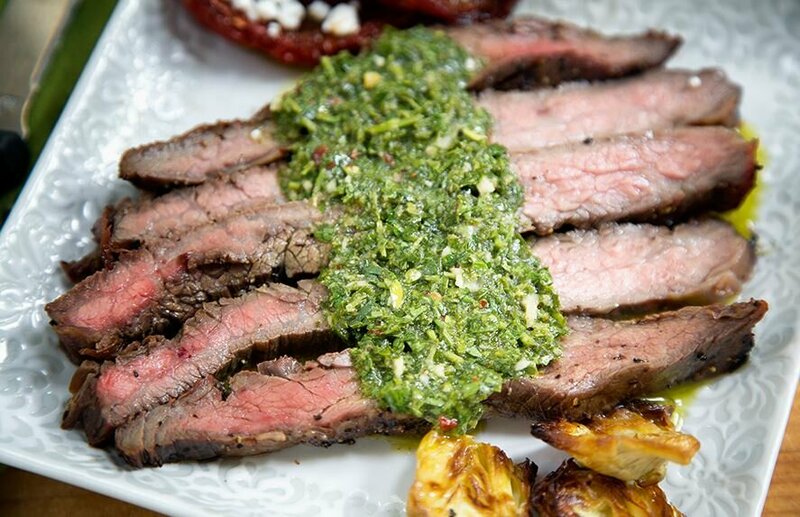 I promise you chimichurri turns any boring, healthy, overly green plate of January-diet-hell into a taste sensation. It keeps – just keep adding a little extra olive oil and you can make a huge bowl full of the stuff and keep it in your fridge. Slap it on everything. Honestly, it’s the future. No carbs, no sugar, no wine, no chocolate – just healthy stuff whizzed together. It takes 5 minutes. Blitz the lot together in a blender and bung it in the fridge – tastes better cold. Serve with…. absolutely anything! I slapped it on some cod fillets tonight and baked them in the oven in tin foil for 15 minutes then served with spinach, avocado and cucumber. And whacked more of my chimichurri on the greens too.